Every now and then we all experience power outages, or perhaps we just want to go a bit old school. Being gamers, we hate being bored, so for this, we bring out our fancy game pieces! This category wont be covering your traditional board games, so ahead of time let me apologize, and say Sorry! that your Operation has given you some Trouble, but at least you have that Monopoly to fall back on! (I had to, sorry!) So instead, we’ll take a look at more un-traditional board games! This was a segment I wanted to personally cover a while ago, approximately a year ago when PAX East 2011 was here because we spent a lot of time in that section of the convention hall. So to kick things off, I present to you; Zombie Dice! Zombie Dice by Steve Jackson games is by far the most simple game I’ve seen. If you can count, you can play! All you need is a little bit of imagination and you’ll be well on your way to munching down on some brains and getting blasted by those shotguns! Damn shotguns… The worst part of it all is when the humans run away! The idea of the game is fairly easy, simply put the first “Zombie” or Player to eat 13 brains is the victor! But getting those Brains will take a bit of luck, as there are 13 dice and each vary in “difficulty”. 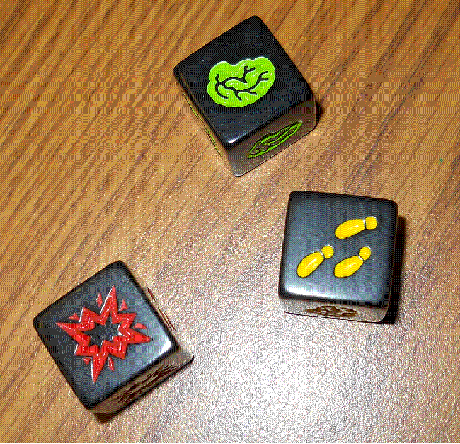 There are three key elements to each dice, the Brain, Shotgun, and Feet. Each of these are displayed on your regular d6 (6-sided die) but they come in different colors, Red, Yellow, and Green. 3x Red – a more difficult “human” to kill, as it has more shotguns then anything else. 6x Green – Easy pray! – more brains then anything else. The goal is to not get “shutgunned” and store up as many Brains as you can within your turn. Within the container it came in, shake it up, and without looking you grab 3 dice, roll them, if you manage to get brains or shot, set those aside, brains are points, and 3 shots are a death. If you managed to get feet, for your next roll, you need to use that die (or dice) on your next roll. So again, you take how ever many you need from the container, to have 3 in hand including the “feet” you rolled and go on from there. Once you get “Shotgunned” which is 3 shots, you are considered dead for the round, and whatever brains you have collected are lost. So play it smart, always STOP when you get 2 shots on you, unless your about to will then who cares! Trying to describe it here has been a bit of a challenge, so why not check it out for yourself?! But most importantly because this is a board game, and its about not having to use power, go buy the actual version of Zombie Dice for a little over $10 off Amazon!